Cyprus – officially the Republic of Cyprus – is a Eurasian island country in the Eastern Mediterranean, south of Turkey and west of Syria and Lebanon. It is the third largest island in the Mediterranean Sea and one of its most popular tourist destinations. An advanced, high-income economy with a very high Human Development Index, the Republic of Cyprus was a founding member of the Non-Aligned Movement until it joined the European Union on 1 May 2004. The earliest known human activity on the island dates back to around the 10th millennium BC. Archaeological remains from this period include the well-preserved Neolithic village of Choirokoitia (also known as Khirokitia), which has been declared a World Heritage Site by UNESCO, along with the Tombs of the Kings. Cyprus is home to some of the oldest water wells in the world, and is the site of the earliest known example of feline domestication. As a strategic location in the Middle East, Cyprus has been occupied by several major powers, including the empires of the Hittites, Assyrians, Egyptians, Persians, Rashiduns, Umayyads, Lusignans, Venetians and Ottomans. Settled by Mycenean Greeks in the 2nd millennium BC, the island also experienced long periods of Greek rule under the Ptolemies and the Byzantines. In 333 B.C., Alexander the Great took over the island from the Persians. The Ottoman Empire conquered the island in 1570 and it remained under Ottoman control for over three centuries. It was placed under British administration in 1878 until it was granted independence in 1960, becoming a member of the Commonwealth the following year. In 1974, following 11 years of intercommunal violence and an attempted coup d'état by Greek Cypriot nationalists, Turkey invaded and occupied the northern portion of the island. The intercommunal violence and subsequent Turkish invasion led to the displacement of hundreds of thousands of Cypriots and the establishment of a separate Turkish Cypriot political entity in the north. These events and the resulting political situation are matters of ongoing dispute. The Republic of Cyprus has de jure sovereignty over the entire island of Cyprus and its surrounding waters except small portions, Akrotiri and Dhekelia, that are allocated by treaty to the United Kingdom as sovereign military bases. 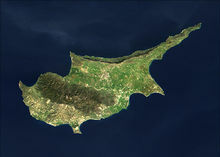 The Republic of Cyprus is de facto partitioned into two main parts; the area under the effective control of the Republic of Cyprus, comprising about 59% of the island's area, and the Turkish-occupied area in the north, calling itself the Turkish Republic of Northern Cyprus, covering about 36% of the island's area and recognized only by Turkey.